0,5 l beer 1. Preheat oven up to 220°C. 2. Separate the meat from the thigh bone, tendon and skin. 3. Form a ball of meat and do it with gauze (30×30 cm), tie the ends. 4. In the deeper pan sort the balls of drumsticks, carrots, onions and apples and pour beer. Three quarters of the leg should be in the liquid. salt, black pepper 1. Remove from the oven, separate legs from the gauze. 2. Mash the rest of the ingredients in a blender to a uniform a thick and spiced sauce. 3. Return the formed legs back in the pan, add the plums and pour sauce. 4. Bake without cover for about 30 minutes. 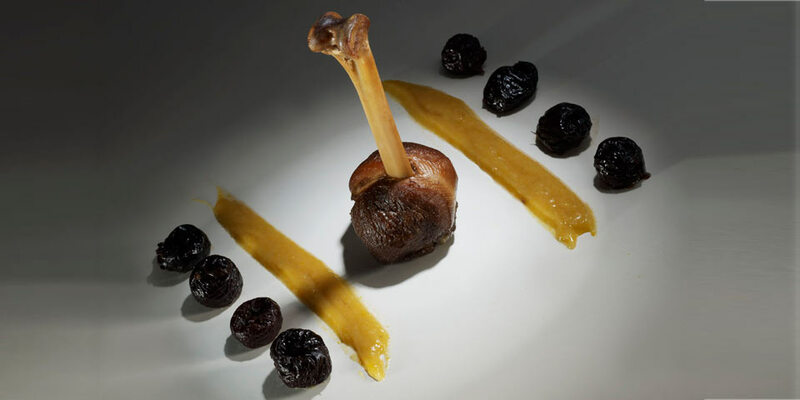 Place the leg meat in the middle of the plate, decoratively put the sauce and place the plums.